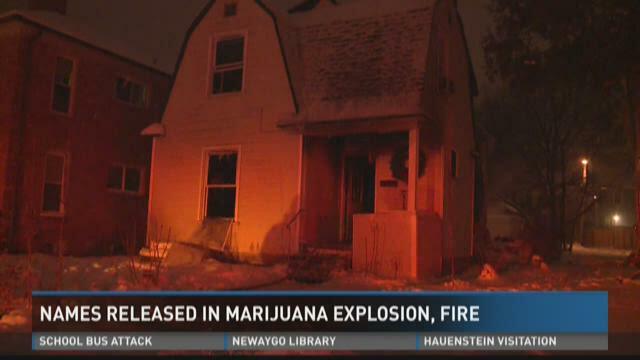 GRAND RAPIDS, Mich. (WZZM) -- The Grand Rapids Police Department has released the names of two men hurt in an explosion at a marijuana grow operation. Christopher Regan, 37, was hospitalized for severe burns and smoke inhalation. John Toscholg, 29, was also treated for minor injuries. The fire happened around 12:30 Wednesday morning near the corner of Sigsbee Street and Giddings Avenue, just a block south of Wealthy Street. Police say the fire started from flammable materials used to process marijuana. A 29-year-old woman and 6-year-old boy were also in the home but were not hurt.